ATLANTA, Georgia (CNN) -- Health officials expect more than 3 million doses of H1N1 flu vaccine to be available in the first week of October. Three flu shot manufacturers were licensed by the FDA last week. "3.4 million doses of vaccines will be available," said Dr. Jay Butler, who heads the 2009 H1N1 Vaccine Task Force at the Centers for Disease Control and Prevention. "All of that vaccine is the inhalable vaccine," he said Friday. That form of vaccine is marketed in the United States as FluMist and is approved only for healthy individuals between the ages of 2 and 49. Pregnant women are not allowed to get this type of vaccine because it contains a live virus. The 3.4 million doses of vaccine that will be shipped at the beginning of October are the first of 195 million doses the U.S. government has purchased from five vaccine manufacturers, Butler said. Last week, the Food and Drug Administration licensed the vaccine from four of those companies. Sanofi Pasteur, Novartis and CSL Limited all manufacture flu shots, and MedImmune manufactures the inhalable vaccine. GlaxoSmithkline, which also is producing injectable flu vaccine, still needs to have its vaccine approved by the agency. Health officials report that the new H1N1 flu virus has not changed from what was seen earlier this year, so they are expecting the vaccine to be very effective. In some parts of the country, the vaccine can't some soon enough. The deputy director of the CDC's Influenza Division, Dr. Daniel Jernigan, said 21 states are now reporting widespread flu activity. "It's a very strange thing for us to see that amount of influenza at this time of year" rather than much later in the flu season. 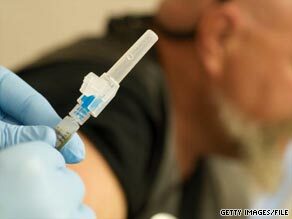 Until the vaccine becomes available, health officials have recommended steps that people can take to cut their chance of getting sick or, for those already sick, prevent the spread of the flu, including frequent handwashing, sneezing into a tissue or sleeve rather than into one's hand, and staying home when sick. Those who are at the highest risk of getting seriously ill -- pregnant women, children, young adults and people with chronic lung or heart disease or diabetes -- should be the first to get vaccinated against the H1N1 flu virus. Health care workers and emergency medical personnel are also encouraged be vaccinated early. According to a CNN/Opinion Corp. poll conducted in late August, 66 percent of Americans plan to be vaccinated against H1N1 flu. Health care workers may not necessarily be among them. In the past, only about 40 percent of health care workers have been vaccinated against flu, according to the CDC.